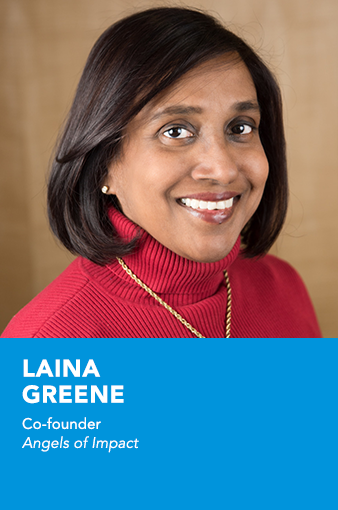 Laina Raveendran Greene is founder of GETIT Inc, an international business planning and strategic marketing consultancy based in Silicon Valley since 2000 and co-founder of Angels of Impact in Singapore since 2016. She also served as Goodwill Ambassador to Unltd Indonesia, as Senior Advisor to Ashoka, as Associate Director (Community Development) of the Asia Center for Social Entrepreneurship & Philanthropy at the NUS Business School and Advisor to Plus Acumen chapter in Singapore. Laina teaches social entrepreneurship as the Senior Adjunct Lecturer at the Business School at NUS and co-teaches Lean Startup for the NUS Overseas College Singapore program at the NUS Enterprise Center. Laina’s work experience spans 25 years in the telecom industry with a focus on Green ICT and bridging the digital divide in developing countries as well as women empowerment and intercultural communication. Her prior work experience included working for profit organizations (Singapore Telecom, INTELSAT, Cisco Systems, Juniper Networks); for non-profits organizations (ISC, IDRC, APIA and APNIC); inter-governmental organizations (ITU, UNDP, World Bank, South Pacific Forum); and even founded an interactive multimedia business in Asia servicing regional high-tech customers (GetIT Comms), which she sold in 2006. She currently lives between Singapore and Silicon Valley.